by Michael J. Hoyle, Ph.D.
Over the last few years, there has been increased focus on the changing role of the Chief Financial Officer (CFO) in corporate America. The same changes are occurring for CFOs on college and university campuses, particularly those at small to medium-sized private institutions. A common thread starts to evolve as I consider recent conversations with peers at sister institutions, read the latest financial education literature and even review the session offerings at NACUBO. Whether formally recognized or not as such by their institutions, college and university CFOs increasingly need to function as Chief Operating Officers (COO) in addition to their more traditional, fiscally-focused responsibilities. The successful CFO acts as the institution's diplomat at large, involving themselves in every aspect of the business of educating tomorrow's workforce. An effective CFO is not only looking at past trends and making sure the books are balanced, but is also proactively focusing on the future, 10 to 20 to 30 years out. More importantly, an effective CFO cannot be confined to the walls of the campus but needs to be just as involved and engaged externally as they are internally. 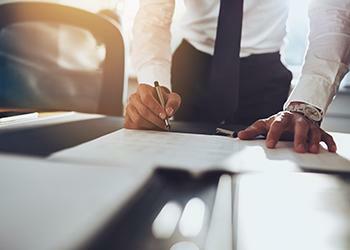 These external connections and collaborations may hold the key to an institution's viability and sustainability, and it is often the CFO who is best positioned to initiate these efforts. The relationship between the CFO, president, and board leadership is critical to the success of many small to medium-sized colleges. The ability for a CFO to have that support to identify and, most importantly, implement change to the business model is paramount. Without that implicit and explicit support, it will be nearly impossible to design and execute the changes that financially stable and challenged institutions will need to implement to remain viable in the years ahead. In theory, this shifting of operational concerns away from the president and onto the CFO's plate will positively impact the presidency. Deloitte published a report in April 2017 titled "Pathways to the Presidency," which detailed the history of the college presidency and the ever-changing role of college presidents. The report especially focused on the dearth of bench strength in higher education as the need for presidents will only increase in the next decade. The report was elegant in the description of the college president as politician, strategist, and academic. One glaring omission from the report was any discussion of the CFO's role in the pathway and the ability of the CFO to enable the president to break away from the role as mayor and instead be the president. The CFO is likely to be the only senior leader, other than the president, to be an officer of the board. This is why today's CFOs are involved in almost every facet of the institution, from enrollment, financial aid modeling, academic program development, fundraising, student retention, residence halls, campus police, conference services, and plant operations -- all responsibilities that resemble a COO and a mayor rolled into one. CFOs are no longer solely the spreadsheet gurus. They must continue to deliver transparent financial information to the community. But more importantly, the CFO collaborates with the president and senior leaders to chart the vision for the next decade and beyond, considers how the institution will pay to implement that vision, and then plays a critical and on-going role to bring that vision to reality. One example of the CFO's reach outside the institution is the rise of new consortiums of private institutions getting together to solve business problems. Middlebury College, Champlain College, and St. Michael's College in Vermont have formed the Green Mountain Higher Education Consortium to consolidate business functions to save money. EdHealth was formed in Massachusetts by six college CFOs to bend the cost curve on health insurance. They have been so successful that the collaborative now numbers 14 institutions and growing. In addition to a founding role in EdHealth, Lasell College proactively reached out to other local institutions. Rather than simply viewing them as competitors for students, they were viewed as potential collaborators. Through consideration of the strategic strengths and needs of each potential collaborator, Lasell was able to provide campus police services to one nearby institution and full IT services to another -- relationships that improved the bottom lines of all involved while simultaneously improving the student and faculty experiences. The Deloitte report made the case that today's college presidents are master conveners, bringing academics, internal administrators, and outside partnerships together. What is unfortunate is that the authors and some college presidents miss the true potential of the college presidency. Seventeen years ago, I defended my dissertation on "The College Presidency and Civic Engagement; Player or Spectator?". The dissertation chronicled the rise of the presidency as a bully-pulpit and how college presidents became the movers and shakers of public policy. After World War II, the influx of federal research dollars, and the rise of think tanks and talking heads, the presidency slowly devolved into its present, primarily fundraising role. By effectively taking on the roles of CFO and COO, today's college CFOs enable presidents to refocus on their more inspired societal role. Obviously fundraising is essential -- perhaps more than ever -- but a successful president-CFO team can enable a refocusing of priorities while also envisioning new opportunities, approaches, and collaborations. The college presidency is more than simply ensuring the trains run on time. The CFO-president team can prevent the further erosion of the presidency into simply being masters of their institutions. It would return their role to leading institutions and putting in place the right people to effectuate change and lead operations. The senior management, prominently including the CFO, should assist the president with vision, strategy development, partnerships, fundraising, and the convening of big ideas that shape communities, society, and policy. CFOs play a critical role in creating this space for modern, forward-thinking presidents to be successful and reclaim their greater historical role.